You’re ready for a new cutting-edge impressive house in an unparalleled location. 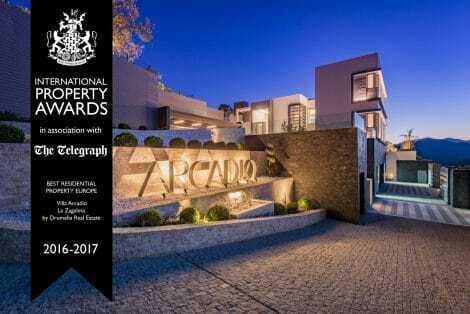 Meet the winner – cool and elegant contemporary property awarded as the Best Single Residence at the last year’s International Property Awards, achieving the highest possible accolade! 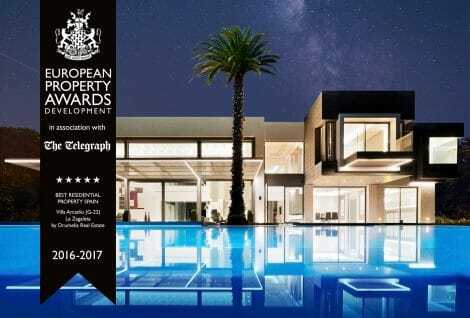 It has truly been created as a unique and stylish home for the very special luxury lifestyle. Immaculately designed and beautifully presented villa offers an amazing open plan living area with a motorised 7 m salon window, double height ceiling and spectacular bio fireplace between salon and dining room that leads to al fresco dining area and Varenna kitchen with refined Italian design, Gaggenau appliances and LED under-counter lighting, 4 bedrooms and 5 bathrooms (possibility of 5th bedroom suite), utility and technical rooms, garage for 2 cars (64m2). Additional living quarters are a fantastic bonus to the main house. Separate apartment with bedroom, living room and bathroom could be used as a guest or staff accommodation, office or fitness centre – the choice is yours! Recently completed eco-friendly house of 795 m² boasts open plan layout and generous proportions of living space, panoramic views and abundance of natural light thanks to the Schüco Sliding System with Panorama Design floor to ceiling windows, Paradox Alarm system, Daiken VRV heating and cooling system, water based underfloor heating, significantly more efficient than traditional systems. Solar control glass prevents from the heat of Andalusian summer, and all windows comply to the highest energy efficiency rating. Innovative heating &cooling systems are the most sophisticated and efficient on the market, utilising air-source heat pumps to heat water. Usually used in commercial properties, here it has been combined with one of the most energy efficient build systems available, offering Sismo structure with additional, increased by 50% over standard acoustic and thermal insulation. It helps to save up to 70% expenses compared to the properties of the same size. Each and every design feature has been exceptionally thought out, and the finest materials and brands have been carefully chosen: Fantini and Tres faucets and rain showers in the bathrooms, bespoke interior carpentry in American Walnut, Lavastone and micro-cement finish on walls. The most modern technology has also been fitted here. Impressive lightning by Delta Light is controlled through the Control 4 Domotic system and all rooms have a touch control panel. Many exciting features make the property exclusive all the way. Modern style elegant beauty and the latest design and technology continue outside where you will be able to spend a fantastic al fresco time: 11m salt water pool with pre-installation for a heat pump and recessed cover, chill out zone with bio fireplace, a yard and landscaped gardens with some spectacular trees like cypress, palms and old olive tree at the entrance, exterior lighting providing a touch of style and creating a stunning landscape that can be enjoyed during night. Villa is accessed via a private road that only serves this property and one other, offering exclusivity and security. 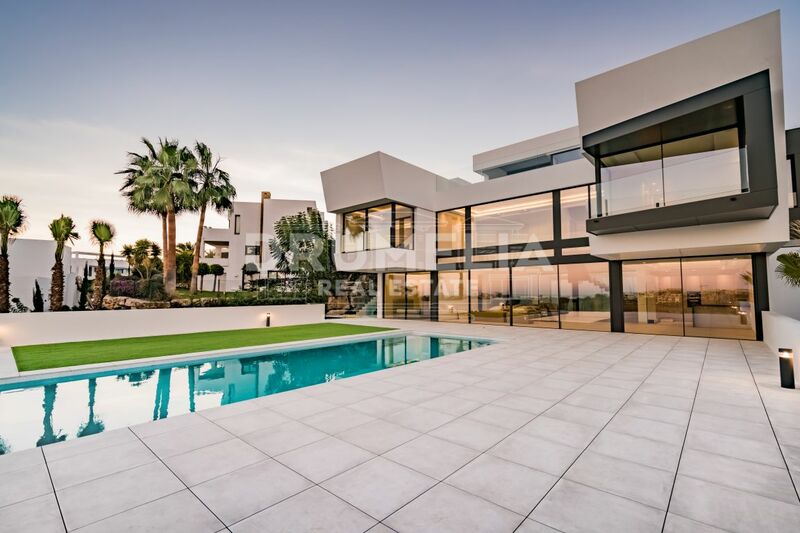 Set in the most sought-after location within prestigious luxurious hillside El Madroñal (often compared to California or Southern France), it boasts undeniably breath-taking sea and mountain views, peace and tranquillity whilst still being close to the entrance of the development. It is one of the 3 similar top-class properties set on 2.600 m² plots, one of which is already sold.